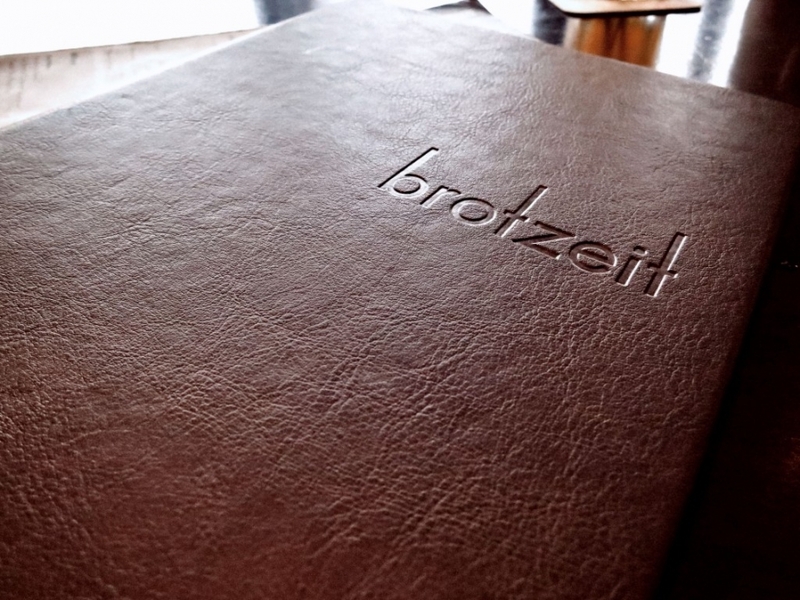 I have eaten in Brotzeit a couple of times and I guess a review is better late than never! The first time I ate in Brotzeit was in Vivo City shopping mall in Singapore and it was packed to the brim. While I don’t drink much alcohol (probably none nowadays! 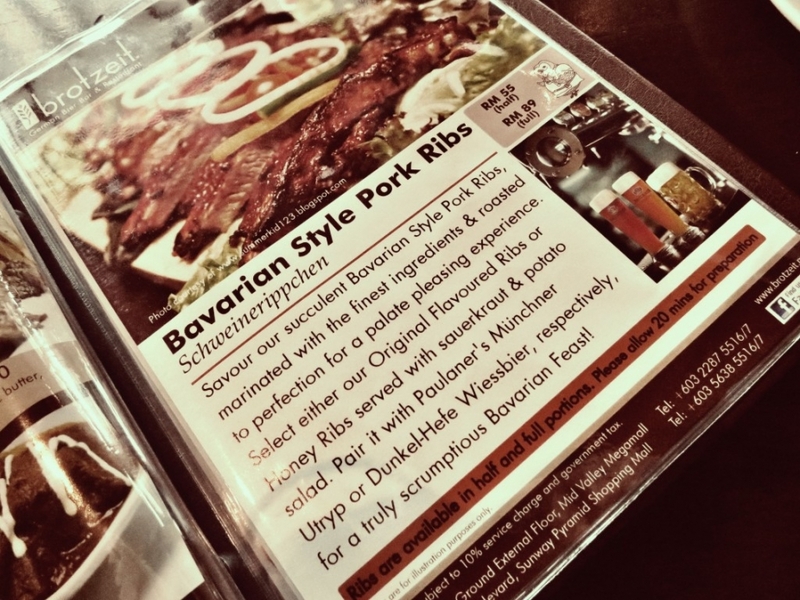 ), its website states that it offers world-famous German beers accompanied by an authentic Bavarian cuisine in a chic and contemporary setting. Apparently, Brotzeit is a typical Bavarian expression whereby ‘Brot’ is for bread and ‘Zeit’ is for time, referring to a cozy meal that is complemented by fresh beer. Well I guess I’d have to agree with that as their German fare will definitely leave you satisfied. 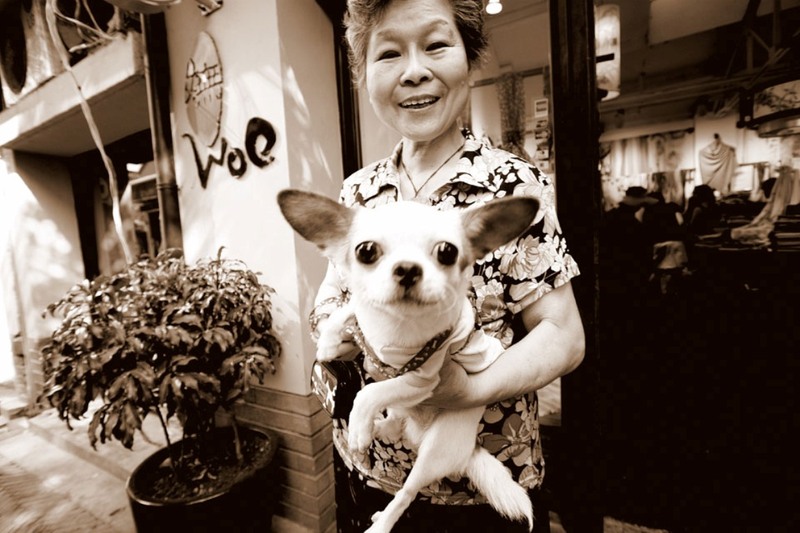 Surprisingly, it is not a German franchise but actually a Singapore grown franchise. Its minimalist decor will appeal to anybody with its simple, long wooden benches that encourage people to just huddle together and exchange great conversation and food for a great night out. 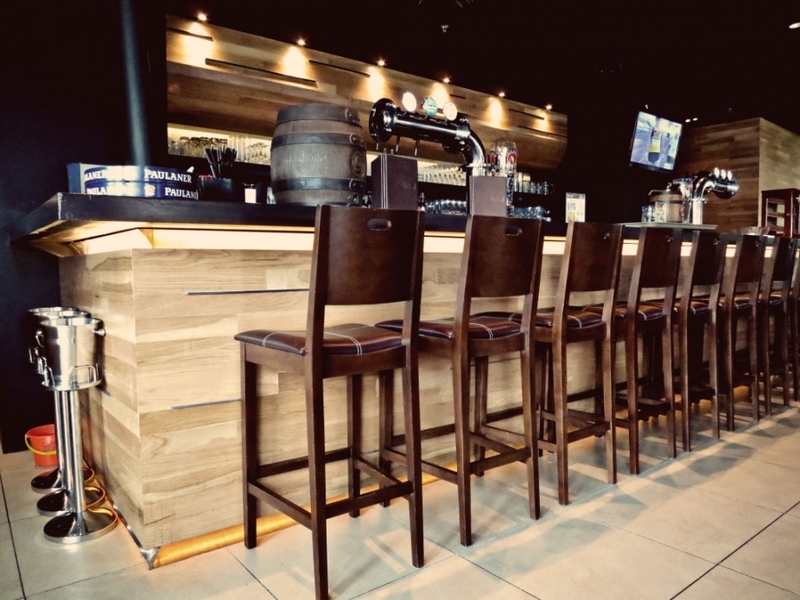 The photos that I have taken for this entry is for its Sunway Pyramid outlet which had its signature long wooden bar counter with high stools. They also have another outlet in Mid Valley. I will readily admit that I am the last person to do a review on alcohol so this is reserved for its lunch sets instead. This is certainly a smart move on their part as the typical office crowd will not spend too much money to dine in a German restaurant for lunch so this promotion works. So if you’re looking for something different and are willing to spend a bit more for your Friday lunch, this place provides a good alternative as you can order dishes that include Peppercorn Chicken, Bavarian Baked Fish Medley, Fish Burger, Mixed Sausages or Bavarian Pork Goulash with either a drink or dessert. The first time I tried the set lunch on a separate occasion, I chose the mixed sausages which is quite foolproof and was neatly presented on a long, white rectangular plate to showcase its three components of a salad, main and fries. The dish had pork Numberger which is a bratwurst from the city of Numberg and is made from coarsely ground lean pork and seasoned with a variety of spices; spicy chicken and mini pork cheese sausage with shoestring fries, salad and laugen rolls. The sausages were definitely top-notch and I suspect that they use natural casings which has a ‘snap’ when you bite into it as opposed to collagen casings. I am no sausage expert but I think I can tell the slight difference against those sold on a mass scale in supermarkets! I also found the laugen rolls unique as I hadn’t had bread like this before. It is actually a wheat roll that is characterized by a dark brown crust which is dunked in a mixture of sodium hydroxide and water. As a result, you will have a dark brown, crispy and salty crust with a soft, chewy dough. Well, I like most types of bread and this was great when paired with the sausages. For the next visit with my mum, I decided to have the Mozarella Pork Fillet instead and it did not disappoint. It comprised of sliced boiled ham, pork fillet, tomatoes and gratinated mozarella on sour dough bread, salad and fries. First of all, anything with mozarella is always welcomed and most importantly, the pork was cooked perfectly as it was succulent and moist. Not too chewy nor dried out. The cheese was not overpowering and was a great topping for the tomatoes. On the other hand, my mum decided to order the Lumberjack Steak which is a pork steak served with crispy onions, garlic butter, shoestring fries and Bavarian coleslaw. The pork was equally good and I may have eaten more than my fair share! I would certainly visit this restaurant again with its good service and recommend this place to anybody who is craving for German food. This probably explains Brotzeit’s ever expanding list of outlets overseas! 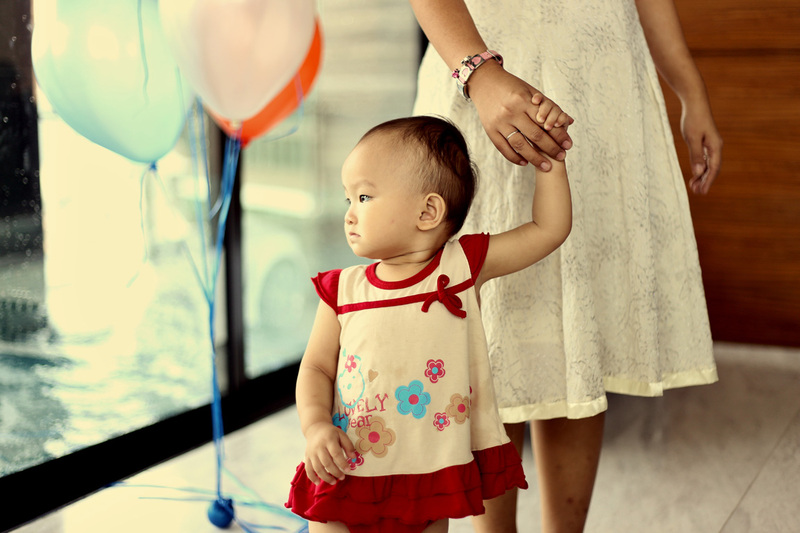 © 2019 Malaysian, Lifestyle, Family Portrait Photographer – Siew Yen Photography|ProPhoto Blog Template by NetRivet, Inc.